Home » Ecommerce , How To , Online Cash » How I Received $25 Bonus with My MasterCard from Payoneer For Free! 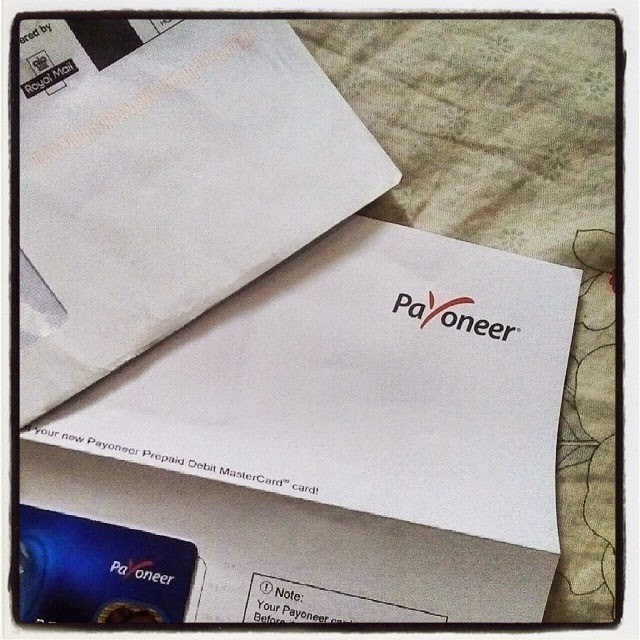 How I Received $25 Bonus with My MasterCard from Payoneer For Free! Hi there, today I'll be showing you latest and best practices on how to receive your Payoneer MasterCard in Nigeria and other countries FREE in 2018. You also will learn how you can make some cool cash online from Payoneer bonuses using your same Payoneer account. Before that I'll like to briefly tell us somethings about this service called Payoneer because they go beyond helping you making money, they also offer wonderful Payment Services. Payoneer is the Best PayPal alternative, it's used to Send and Receive mass payments with/from or for Individuals, Small and Big Companies. Payoneer Debit MasterCard service is awesome. With your Payoneer Account and MasterCard, you can Use it to Link and Verify your PayPal Account. Payoneer creates a U.S Local bank account for you, which means You can use your Payoneer to withdraw your PayPal funds or any Cash deposited into your Bank Account. You Can use your Payoneer to Receive and Withdraw your Amazon Earnings from any part of the World. Just Like me you too can get $25 as Bonus along with your Payoneer MasterCard, you can receive your Payoneer card in Nigeria like me, and it's Absolutely easily & Free. 2. Make sure you Input your Real Name, Home Address and your POSTAL code number of your Address, they'll be needing it to easily locate you. 3. Asking Your IDENTITY in Payoneer, You can take a Picture of any of your Government issued I.D cards, like your Voters Card, Driver's License or National I.D (Front and Back), they'll provide you option to either Send the documents to their email or Upload them. In my case, I used my Voter's Card, I Chose to send it to them via Email so they can See and confirm the front and back where the Serial Number of the I.D is written, this proves to them that you're Serious and Genuine. 4. Serial number of I.D - You can input those numbers written in your I.D cards, e.g below the back of your Voter's card or National I.D, that's all I did. It took 20 Days (almost a month) for it to be processed and shipped to my address in Lagos, Nigeria. Note: Reason for the delay was due to my Location was quite far from Payoneer's Home Office, people living closer to Payoneer's operating office should receive theirs faster. Once you get the MasterCard, you'll get an Email asking you to ACTIVATE. Go to your Account and use the Payoneer MasterCard to Activate it with the CCV code at back of the Card, more importantly, you activate the card also by changing the password (ATM Pin) of the card. Now load or Receive 100$ into your Payoneer Account and you will get 25$ as bonus instantly. 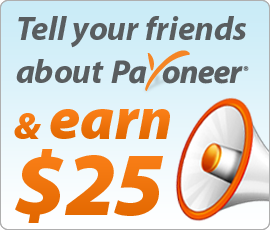 Now, you can Double your Bonus by Referring or Inviting friends to use the Payoneer Service. You see, why I actually love this part is that; it's a WIN-WIN program, everybody gets the bonus, they too will receive the bonus with you, the more you refer, the more your Bonus will Double and Triple from $25 to 50, to $100 then you can withdraw your Bonus from any ATM Machine which supports MasterCard near you. Once again follow this Link here or click the Banner below to Join and Get your $25 Now! We hope this Post was useful for you, why not take a Second to press the SHARE BUTTON below to let others know about it. Sorry, Nwachukwu Enyioko, they don't have an Office in Nigeria now. But you can always call them to ask, or visit the nearest post office in your locality.